Port Metro Vancouver says that cruise ship visitation to Vancouver is up over 20 percent this year on lat year. Port Metro Vancouver� manager of business development, Carmen Ortega said that is expected to translate into about 820,000 passengers on 236 sailings, with last season 667,000 passengers on 191 calls, according to a report in the Vancouver Sun. 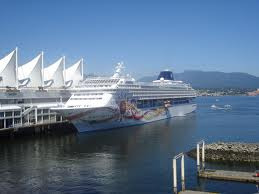 The report goes on to say that the province�s cruise industry has taken a couple of hits in the past decade, with after the lull caused by 9-11, cruise ships began returning to North America, but many of them docked in Seattle. Vancouver had its peak year in 2002 with a little over a million passengers, but lost some ground to the Port of Seattle after that, plus the implementation of an Alaskan head tax of $46 in 2006 increased the cost for cruise lines, resulting in fewer ships to Alaska. The increase in cruise traffic in the city is due to additional ships that have begun docking at Port Metro Vancouver this year, with The Disney Wonder and Holland America Line�s Amsterdam returning after operating last year from Seattle, the Norwegian Sun back for the first time since 2009 and Oceania�s Regatta, home porting in Vancouver for the first time. Ms Ortega said Vancouver is the only home port in B.C., and the main cruise home port in Canada and that means the cruises begin and end here. Ms Ortega added that guests, if they�re staying in the city for a few nights, might splurge on a trip to see the Rocky Mountains. While most travelers approach the fabled 'Inside Passage' from various points due south, my first experience of this 1,200 mile Marine Highway, was from Canada's Klondike, having plied the Yukon River for four eventful days aboard the SS Casca, a classic paddle-wheeler ; chugging and puffing our way upstream from Dawson City to Whitehorse. After an overnight at the Regina Hotel, with its ornate lamps and Victorian furnishings, we boarded the narrow-gauge White Pass & Yukon Railway for a day trip, detraining on a wooden platform at historic Skagway. This sleepy little seaport on Alaska's Lynn Canal, came to fame 100 years ago, during the Jefferson (Soapy) Smith era, as a lawless, rough and ready frontier town at the foot of the White Pass. "Most people who travel look only at what they are directed to look at." John Muir, Travels in Alaska. FILM FESTIVAL AT SEA: The Films to Sea Festival, a seven-day Alaskan cruise, showcased 14 international film premiers while sailing through the Inside Passage and Glacial Bay National Park starting in August. Holland American Lines' M.S. Zaandam's screening room is not as big as downtown Vancouver's Tinseltown theatres, but is elegant nonetheless. Dusty Cohl, Toronto's film festival czar, organized the first such cruise in 1990 as a fun way to bring his friends together. Its success led to more such experiences and this year, organizers decided to host the West Coast cruise to involve Vancouverites who had shied away from Cohl's East Coast excursions. In some places the passage is quite narrow and twisting, making for some exciting moments as the skillful officers navigate the vessel through seemingly impossible places. Seymour Narrows, 100 miles north of Vancouver is such a place- much safer since the mid-channel Ripple Rock was blasted in 1958, but still a tight, S-shaped pass. Another is the fjord named Grenville Channel- difficult to maneuver, but spectacular to behold, with mountains creating walls against which waterfalls tumble. Once you enter American waters, it's like you've taken a step back in time as you go ashore to visit the old frontier towns. Ketchikan is Alaska's southernmost major city and is the home of the world's largest collection of totem poles. Its waterfront buildings rise above Tongass Narrows supported by a forest of pilings and joined together by a picturesque boardwalk. Wrangell began as a fur-trading post in 1834 and has been governed under three flags: Russian, English and American. Evidence of even earlier inhabitants can be seen in some intriguing petrographs. Juneau, Alaska has the distinction of being the only US capital that can be reached only by air or sea. This gateway to Glacier Bay rests between towering Mt. Juneau and the Gastineau Channel. Skagway is the historic town where the great Klondike Gold Rush of 1889 is relived. It is headquarters of the White Pass and Yukon Railroad, the last single gauge railroad in operation. Sitka sits in the shadow of Mt. Edgecombe, a 3201 ft high extinct volcano. It was once the seaside capital of Russian America and a visit here certainly evokes the 18th century. For many, the highlight of their Inside Passage Cruise will be the glaciers at Tracy Arm and Glacier Bay. Standing on an active glacier and maybe catching sight of a humpback whale is one of the world's truly unique experiences. For those who wish to venture further than the Inside Passage, there is the Glacier Cruise. This 7 to 10 day, one way route continues on into the Gulf of Alaska, and may continue into Prince William Sound, terminating in Seward, Whittier or Anchorage. (The Cruise may also be taken in reverse- southbound to Vancouver). Once your ship leaves the Inside Passage it's glaciers all the way, one more spectacular than the last: LaPerouse, Hubbard, Columbia and the numerous glaciers of College Fjord. In our "Super Cruise Guide," we salute the sleek Empresses that wore the colours of Canadian Pacific, and as an extension of the mighty CPR, sailed from Vancouver to exotic ports o'call in the distant Orient. They did us proud. Their smaller, more modest sister ships, Princesses of the BC to Alaska fleet plied the Inside Passage from Seattle, Victoria and Vancouver to the Northern ports along the Alaska Panhandle. They carried freight and passengers to remote points; setting the stage for today's love boats and floating hotels. It was on the SS Princess Norah that I experienced my first memorable sea cruise as featured in my series 'Klondike Memories.' Since I found the history of the Inside Passage such a fascinating study, I am sure our potential cruise passengers would like to know more about its background and discovery. The new Super Cruise Guide is based on the success of our Air Highway Supermaps and the earlier overland versions created for Best Western and Avis, which feature auto travel,accommodation and intermodal connections. Close to 500,000 of our various maps are in circulation. Above: Inside Passage from Vancouver to Alaska. The Fotomation sequence (above) is from the Ship to Shore Conference, where the major Alaska cruise lines entertained and educated Travel Agents from across North America. We feel very close to happenings at Vancouver's BC-Alaska cruise ship terminal, since our offices are only a few blocks away. With the help of my friend Ed Anderson, we will be documenting in words and pictures some of the major changes occuring all around the inlet. Regarding the Inside Passage, some of the fun ports of call when I was young were Prince Rupert and Alert Bay, which until now had been bypassed by the Alaska bound love boats and floating hotels, but the times they are a changing. We can expect Prince Rupert to blossom as a cruise port, and Victoria to rapidly increase its share of the cruise business. While Expo '86 served to put Vancouver and BC on the map, the 2010 Olympics will add another boost of world attention -- and the entire travel tourism sector will benefit. New shorter "Pocket Cruises" Royal Caribbean International is offering something new for cruise enthusiasts with the addition of a "pocket cruise," a shorter three-to four-day cruise between Vancouver, Victoria and Seattle on its Vision of the Seas, pictured in the 'fotomation' above. The numbers reflect healthy growth for the Vancouver-Alaska cruise industry. Everyone involved in the Vancouver-Alaska cruise experience should be proud of this exceptional performance," said the VPA Chairman. The number of ships dedicated to this itinerary has remained steady over the last couple of seasons, with 24 vessels representing 10 cruise companies calling on Vancouver. The average number of passengers per voyage climbed steadliy, a new market offering will begin with the addition of the pocket cruise option of three to four-day cruises, which should provide further growth for the industry.